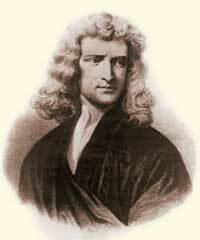 His father dead before his birth and his mother remarried within 3 years, Newton was left in the care of a grandmother. Difficult early years may have contributed to his difficult personality as an adult. He graduated from Trinity College, Cambridge, and served there as Lucasian Professor. Later Newton was warden of the mint in London and president of the Royal Society. Newton's remarkable intellectual accomplishments include creation of the calculus, invention of the reflecting telescope, development of the corpuscular theory of light, and development of the principles of gravity and terrestrial and celestial motion. A "Newtonian" worldview came to permeate understanding not only of the physical world, but also of such intellectual fields as politics and economicsin which people now sought simple and universal laws of the type demonstrated by Newton in physics and astronomy. Hitherto I have not been able to discover the cause of those properties of gravity from phenomena, and I frame no hypotheses... And to us it is enough that gravity does really exist, and act according to the laws which we have explained, and abundantly serves to account for all the motions of the celestial bodies, and of our sea. The omnipresence of God pervaded the Newtonian cosmos. The divine presence operated as an immaterial "aether" that offered no resistance to bodies, but could move them through the force of gravitation. Newtonian gravitational theory practically demanded a continual miracle to prevent the Sun and the fixed stars from being pulled together. Newton envisioned an infinitely large universe, in which God had placed the stars at just the right distances so their attractions cancelled, as precisely as balancing needles on their points. Another possible solution was to place the fixed stars at such vast distances from one another that they could not attract each other perceptibly in the few thousand years since the Creation. The ancient assumption that the stars were fixed in position was not seriously questioned until 1718, when the English astronomer Edmond Halley reported a remarkable discovery. Three bright stars were no longer in the positions determined by ancient observations. The stars were freed to move like normal physical objects. Image of Descartes' vortices from his 1644 book Principia Philosophiae. Newton treated the motions of the stars and planets as problems in mechanics, governed by the same laws that govern motions on Earth. He described the force of gravity mathematically. The French philosopher René Descartes, on the other hand, had proposed a non-mathematical model. He suggested that the universe consists of huge whirlpools ("vortices") of cosmic matter. Our solar system would be only one of many such whirlpools. Descartes banned from scientific investigation "occult" phenomena, or causes hidden from the senses. He had celestial matter circulating about the Earth, pushing all terrestrial matter toward the Earth. Descartes' followers distrusted Newton's alternative, a mysterious gravitational force acting at a distance. Descartes' mechanical, mechanistic cosmology was highly acceptable within the general seventeenth-century conception of the world as a machine. His explanations, though, were but qualitative re-descriptions of phenomena in mechanistic terms. During the course of the eighteenth century, vortex theory proved unable to calculate the observed planetary motions. Meanwhile, the rival Newtonian theory advanced from one precise quantitative success to another. The solar system contains many bodies, and the calculation of the orbit of any planet or satellite is not simply a matter of its gravitational attraction to the body around which it orbits. In addition, other bodies have smaller, but not negligible, effects (called "perturbations"). For example, the Sun alters the Moon's motion around the Earth, and Jupiter and Saturn modify the motions of each other about the Sun. A Swiss mathematician, Leonhard Euler, helped develop the mathematical techniques needed to compute perturbation effects. First he applied them to the Moon, and then, in 1748, to Jupiter and Saturn, with partial success. Still unexplained were large anomalies in the motions of Jupiter and Saturn, and an acceleration of the Moon's orbital speed around the Earth. The French mathematical astronomer Pierre-Simon Laplace resolved these in 1785 and 1787. In his book Mécanique Céleste, published in five volumes between 1799 and 1805, Laplace summarized his studies of celestial mechanics. Here he proposed that all physical phenomena in the universe could be reduced to a system of particles, exerting attractive and repulsive forces on one another. I have wanted to establish that the phenomena of nature reduce in the final analysis to action-at-a-distance from molecule to molecule and that the consideration of these actions ought to serve as the basis of the mathematical theory of these phenomena." Laplace's writings were not just for scientists. His 1796 book Exposition du Système du Monde summarized for lay people the general state of knowledge about astronomy and cosmology at the close of the 18th century. In the book, Laplace advanced an idea that became known as the "nebular hypothesis." He suggested that our solar system, and indeed all stars, were created from the cooling and condensation of a massive hot rotating "nebula" (a gassy cloud of particles). The nebular hypothesis strongly influenced scientists in the 19th century, as they sought to confirm or challenge it. Elements of the idea remain central to our current understanding of how the solar system was formed. Writers of the Romantic period in the early 19th century— for example William Wordsworth in England and Friedrich Schelling in Germany — reacted against Newtonian cosmology. Convinced that the cosmic order was beyond scientific explanation, they sought to breathe divine life back into what seemed an overly mechanized and increasingly godless universe. The German philosopher Immanuel Kant argued against the Romantics, insisting that metaphysics could not provide an account of the foundations of physical, corporeal nature, and that the issue of the existence of God was completely divorced from direct sense experience. For him, the Newtonian solar system provided a model for the larger stellar system. Kant reasoned that the same cause which gave the planets their centrifugal force, keeping them in orbits around the Sun, could also have given the stars the power of revolving. And whatever made all the planets orbit in roughly the same plane could have done the same to the stars. Nebulous-appearing objects in the heavens became, in Kant's mind, island universes, like colossal solar systems. Kant's thoughts about the universe had little observational content. The foundations of his cosmological hypotheses were philosophical and theological. Observation first entered cosmology in a major way late in the 18th century, thanks to an English amateur astronomer, William Herschel. Copyright: National Portrait Gallery, London. Used with permission. The Newtonian solar system offered a model for the larger stellar system. The arrangement of the stars might well be similar to that of the planets. Furthermore, the Newtonian system provided by analogy a physical explanation for a disk structure. The same cause which gave the planets their motion and directed their orbits into a plane could also have given the power of revolving to the stars and brought their orbits into a plane. In the late 18th century, observation at last entered stellar cosmology in a major way, in the person of the English amateur astronomer William Herschel. His discoveries were made possible by large telescopes of his own construction. Photo mosaic of the Milky Way, as it appears to the naked eye in clear skies far from cities. Looking out from Earth (at center) toward us, a dense slab of stars becomes the band of the Milky Way. Looking away from us, a split in the Milky Way comes from a division in the distribution of stars. From his observations, William Herschel reported in 1784: "A very remarkable circumstance attending the nebulae and clusters of stars is that they are arranged into strata, which seem to run to a great length; and some of them I have already been able to pursue, so as to guess pretty well at their form and direction. It is probably enough, that they may surround the whole apparent sphere of the heavens, not unlike the milky way, which undoubtedly is nothing but a stratum of fixed stars." This diagram, from Herschel's 1784 paper on the construction of the heavens, shows how an observer located at the center of a thin stratum of stars will see the surrounding stars projected as an encircling ring. If the stratum splits, so will the ring. Herschel's telescopes, culminating in 1789 with an awkward monster forty feet tall, were one of the wonders of the world. These powerful telescopes not only revealed more moons about planets and resolved some fuzzy-appearing nebulae into clusters of stars, but also enabled Herschel to reach farther into space than anyone had done before, and to begin to outline the structure of our galaxy. Herschel observed stars seemingly lying between two parallel planes and running on to great distances. He concluded that the Milky Way (a luminous band of light circling the heavens) is the appearance of the projection of the stars in the stratum. ...We shall look upon those regions into which we may now penetrate by means of such large telescopes, as a naturalist regards a rich extent of ground or chain of mountains, containing strata variously inclined and directed, as well as consisting of very different materials. In his 1785 paper "On the Construction of the Heavens," Herschel wrote that our Milky Way is a very extensive, branching, compound Congeries of many millions of stars. Herschel's drawing shows a cross section through the Milky Way, our galaxy, as determined from his observations. Herschel proposed to determine the position of the solar system in the stratum of stars by " 'gaging' the heavens," that is, by counting the number of stars in different directions. This number, Herschel argued, assuming the stars to be equal in brightness and equally scattered, would be proportional to the distance to the edge of our galaxy in each particular direction. Although logically correct, his method failed in his day to get a true picture of the Milky Way , for his telescope could not detect ordinary stars at the farthest reaches of our galaxy. Further, as Herschel himself recognized, there was no good reason to assume that the stars are equally bright and equally scattered. During the nineteenth century, Herschel’s speculative cosmology failed to attract disciples. Professional astronomers could not accept his assumption that stars are equal in brightness, although it was needed as a working hypothesis to estimate the stars’ distances. Remarkable new observational techniques, photography and spectroscopy, did address cosmological questions, but indecisively. In 1835, the prominent French philosopher Auguste Comte, remarked that humans would never be able to understand the chemical composition of stars. He was soon proved wrong, because spectroscopy and photography helped bring about a revolution in people's understanding of the cosmos. For the first time, scientists could investigate what the universe was made of. This was a major turning point in the development of cosmology, as astronomers were able to record and document not only where the stars were but what they were as well (a subject we do not cover in this Website). Amateur astronomers — the professionals by definition were already engaged in well-defined research projects such as mapping stars — made photographs that showed some nebulae were made up of many stars. But other nebulae remained obdurately nebulous. And nobody was able to decisively show changes in nebulae over time. Spectroscopy held out a promise of differentiating between nebulae made of many stars and those made of glowing gases, and also of determining if nebulae were rotating . But here also the conclusions were questionable. As, indeed, was cosmology itself as a scientific endeavor. Advances in cosmology during the nineteenth century were considerable, but only in the twentieth century would cosmology be transformed from speculation, based on a minimum of observational evidence and a maximum of philosophical predilection, into a respectable observational science. Approaching the beginning of the 20th century, the worldview pioneered by Herschel was vastly different from that of Aristotle or even Copernicus. No longer were human beings necessarily at or very near the center of the universe. The Milky Way was now understood to be an optical effect, with our solar system immersed in a much larger stratum of stars, a roughly disk-shaped stellar system. Possibly other island universes were scattered throughout a possibly infinite space. Changing cosmological understanding is manifested in changing social views. Now that we Earthlings were but one of possibly many intelligent inhabitants of a possibly infinite universe, there was less reason to believe that we had been created in the best of all possible worlds, and perhaps more sympathy for discontent with the established social hierarchy.